Stereotactic surgery or stereotaxy is a minimally-invasive form of surgical intervention which makes use of a three-dimensional coordinates system to locate small targets inside the body and to perform on them some action such as ablation (removal), biopsy, lesion, injection, stimulation, implantation, radiosurgery etc. “Stereotactic” in Greek (another accepted spelling is “stereotaxic”) means movement in space.In theory, any organ system inside the body can be subjected to stereotactic surgery. Difficulties in setting up a reliable frame of reference (such as bony landmarks which bear a constant spatial relation to soft tissues), however, mean that its applications have been limited to brain surgery. Besides the brain, biopsy and surgery of the breasts have also been attempted. The stereotactic method was first developed by two British scientists in 1908, working at University College London Hospital, Sir Victor Horsley, a physician and neurosurgeon, and Robert H. Clarke, an engineer. The Horsley-Clarke apparatus they developed was used for animal experimentation and implemented a Cartesian (three-orthogonal axis) system. Improved designs of their original device came into use in the 1930s for animal experimentation and are still in wide use today in all animal neuroscience laboratories. The stereotactic atlas is a series of cross sections of anatomical structure (for example, a human brain), depicted in reference to a two-coordinate frame. Thus, each brain structure can be easily assigned a range of three coordinate numbers, which will be used for positioning the stereotactic device. In most atlases, the three dimensions are: latero-lateral (x), dorso-ventral (y) and rostro-caudal (z). The stereotactic apparatus uses a set of three coordinates (x, y and z) in an orthogonal frame of reference (cartesian coordinates), or, alternatively, a polar coordinates system, also with three coordinates: angle, depth and antero-posterior location. The mechanical device has head-holding clamps and bars which puts the head in a fixed position in reference to the coordinate system (the so-called zero or origin). In small laboratory animals, these are usually bone landmarks which are known to bear a constant spatial relation to soft tissue. For example, brain atlases often use the external auditory meatus, the inferior orbital ridges, the median point of the maxilla between the incisive teeth. or the bregma (confluence of sutures of frontal and parietal bones), as such landmarks. In humans, the reference points, as described above, are intracerebral structures which are clearly discernible in a radiograph of tomogram. Guide bars in the x, y and z directions (or alternatively, in the polar coordinate holder), fitted with high precision Vernier scales allow the neurosurgeon to position the point of a probe (an electrode, a cannula, etc.) inside the brain, at the calculated coordinates for the desired structure, through a small trephined hole in the skull. 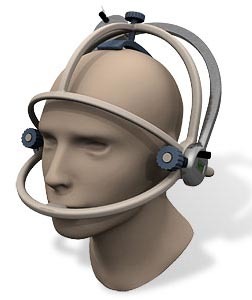 Presently, there are a number of manufacturers of stereotactic devices fitted for neurosurgery in humans, as well as for animal experimentation.